This week, India’s latest Joint Armed Forces Doctrine was made public. The document offers insight into the principles that guide the Indian military’s approach to warfighting. Released by Admiral Sunil Lanba, the chairman of the Indian chiefs of staff committee, the document focuses on India’s conception of its national security and its strategy for managing threats across the “full spectrum of military conflict.” In this sense, the document addresses the principles guiding the Indian military’s approach to everything from nuclear war to internal security and counter-insurgency. The document will merit sustained and serious scrutiny. Below, I highlight a few (early and provisional) takeaways that jumped out to me on a first read. One of the first and most obvious observations that has already drawn headlines in the Indian press is that the doctrine explicitly acknowledges that so-called “surgical strikes” will, going forward, be a formal part of India’s retaliatory toolkit against “terror provocations.” India claimed to demonstrate this last September, after the deadly Uri attack, in which Pakistan-based militants killed more than a dozen Indian Army soldiers. Moreover, there is evidence of operations by Indian forces across the Line of Control (the de facto border demarcating India- and Pakistan-administered Kashmir) going back to the early 2000s. Nevertheless, insofar as the joint doctrine document is intended for consumption across India’s western border, the explicit mention of “surgical strikes” is a signal. President Trump has issued an executive order directing some U.S. agencies to review the nonimmigrant, H-1B work visa policies, which at present allow companies to hire “skilled” foreign workers when employers say they cannot find qualified Americans. Trump has questioned the impact of the program, saying that it represses American wages by paying foreign workers less. The U.S. issues 85,000 H-1B visas annually, and extends or reissues another 100,000 visas, according to Forbes. Last year, nearly 127,000 visas went to Indian nationals, about 21,700 to Chinese workers and 2,540 to Mexicans to round out the top three. Should the review lead to curtailing the visas, on first glance it looks likely to hit Indian professionals — and Indian tech companies in particular — the hardest. But in this opinion piece, Ignatius Chithelen argues that some Indian visa holders could actually end up ahead. He is the author of Six Degrees of Education: From Teaching in Mumbai to Investment Research in New York, and the founder and managing partner of Banyan Tree Capital Management. The Supreme Court should make amends for its foolhardiness in weakening Indian cricket by insisting that nothing less than the old revenue formula can be accepted by the CoA. If it does not do that, it will have failed to protect Indian cricket’s interest. Which is what it set out to do when it started meddling with the BCCI. It is difficult to see why the Supreme Court, which took an enormous interest in the affairs of the Board of Control for Cricket in India (BCCI), should not share a part of the blame for the diminution of India’s clout and revenues in the world of cricket. This conclusion cannot be avoided given the sorry figure India has cut at the recent meeting of the International Cricket Council (ICC), where members voted 9-1 to cut BCCI’s revenue share from around $570 million negotiated some years ago to just over half that number, around $290 million. A compromise formula may still get the BCCI some more money, but it would still not be as much as what was agreed earlier. This is about surrender when only tough negotiations were required. Two Pakistani intelligence officials say an overnight suspected U.S. drone strike has killed seven militants in a tribal region near the Afghan border. The officials said Wednesday’s strike in Zuwai village in North Waziristan was the first since 2014 when the Pakistan army launched a major military operation there. The officials said Thursday no high value militant was killed in the strike. The officials spoke on condition of anonymity as they were not authorized to speak to media on the record. Pakistan’s tribal regions have been the scene of CIA drone strikes and Pakistani operations, forcing militants to flee toward Afghanistan and set up sanctuaries there. The long awaited Panama Papers verdict on 20 April, 2017, by the five-judge bench of Pakistan's Supreme Court has stopped short of disqualifying Prime Minister Nawaz Sharif and given him a temporary reprieve by ordering investigation by a Joint Investigation Team (JIT) of officials, including those from the Inter-Services Intelligence (ISI) and Military Intelligence (MI), within 60 days, under Court supervision. The 3-2 split verdict suggests that while there may have been enough substance to justify that Sharif may not have been either `sadiq’ (honest) or `ameen’ (trustworthy), thus meriting disqualification under Articles 62 and 63 of their Constitution, this power could not be exercised by the Supreme Court in its `original jurisdiction’ powers under Art 184(3), as it did not relate to a question of public importance related to a Fundamental Right. It purports though, that there were enough grounds to believe that the prime minister and his family members had obfuscated the money trail about the off-shore accounts and especially, the transaction pertaining to purchase of the Mayfair flats in London. The JIT has been tasked to work on a `thirteen point’ list of items pertaining to the money trail covering the setting up of the Gulf Steel Mill in Dubai; subsequent sales in Saudi Arabia and Qatar; and details of purchase transactions of the Mayfair flats. The judgment virtually dismisses the veracity of the Qatari Sheikh, Jabbar al Thani’s bailout letters about the money transactions. It also opens up the possibilities of re-opening of the Hudaibiya Paper Mills money laundering investigations of the early 1990s by either the Federal Investigation Authority (FIA) or the National Accountability Bureau (NAB). The role of NAB Chief Qamar Zaman in not challenging the September 2014 Lahore High Court verdict exonerating the Sharifs in the Hudaibiya case has been castigated. The JIT’s would now be `a criminal investigation’, which would have to be placed before a fresh bench of the Supreme Court to finally decide on the matter. Given the immensity and gravity of this danger, it might seem silly and ghoulish to quibble over which nuclear weapon country is a greater danger than the others. Nevertheless, in the 70-year history of nuclear weapons such comparisons have often been made by diplomats, national leaders, scholars, and the media. Motivations have varied. Mostly they come from genuine concern for the safety of that region and of the world in general. But sometimes it is part of the thrust and parry of diplomatic engagement, or a strategic step to name and shame a country. It can also be a strategy for individuals and nongovernmental organizations specializing in that region to enhance the importance of their scholarly niche and ensure the next tranche of grant money. Decades of near double-digit GDP growth have enabled China’s leaders to make considerable strides in increasing food access across the country. Yet China’s economic boom has generated a new set of demographic demands and environmental strains that have affected its agricultural capacity. This feature explores China’s domestic production, the changing dietary demands of its public, and the role international trade plays in China’s food security. What do we know (so far) about China's second aircraft carrier? It displaces roughly 65,000 – 70,000 tons, a few thousand more tons than the Liaoning. Mentions of exploits and tools released by the Shadow Brokers hacker group have been cropping up increasingly on Chinese- and Russian-language websites, indicating that weaponization is imminent. Shadow Brokers, most known for the August 2016 release of NSA tools and exploits, released its latest batch of malware April 15. Reverse engineering and reporting by security researchers, such as threat intelligence company Recorded Future, identified the exploit framework (named FUZZBUNCH), the SMB malware (ETERNALBLUE) and the privilege escalation tool (ETERNALROMANCE), as well as the DOUBLEPULSAR kernel payload. This release has resulted in broad interest among top-tier dark-web cyber communities centering on malware trigger points and setup tutorials for the new exploits. Malicious actors may reuse or repurpose these toolsets to take advantage of underlying vulnerabilities. The research, including links to alerts and critical system patches that could help minimize vulnerabilities, can be found at RecordedFuture.com. An expert on China provided members of Congress a broad overview Wednesday of current Chinese military and strategic thinking, including China’s People’s Liberation Army (PLA) focus on “informationization” (xinxihua) and “informationized warfare” (xinxihua zhanzheng). The expert also outlined the Chinese “integrated” view of cyber, network, electronic, space and kinetic warfare. Dean Cheng, senior research fellow at The Heritage Foundation’s Asian Studies Center, gave oral and detailed written testimony to the U.S. House Foreign Affairs Subcommittee on Asia and the Pacific. The hearing occurred on World Intellectual Property Day, with opening remarks from Subcommittee Chair Ted Yoho, R-Fla., noting China’s “systematic and widespread theft” of American intellectual property. The hearing’s oral testimony leaned toward trade and economic issues in what Yoho characterized as the “most consequential bilateral relationship in the world,” but discussion regularly reverted to China’s ongoing cyber espionage and its continued use of soft-power tactics to outmaneuver the U.S.
WASHINGTON — President Trump summoned all 100 members of the Senate for a briefing by his war cabinet on the mounting tensions with North Korea. An American submarine loaded with Tomahawk missiles surfaced in a port in South Korea. Gas stations in the North shut down amid rumors that the government was stockpiling fuel. Americans could be forgiven for thinking that war is about to break out. But it is not. The drumbeat of bellicose threats and military muscle-flexing on both sides overstates the danger of a clash between the United States and North Korea, senior Trump administration officials and experts who have followed the Korean crisis for decades said. While Mr. Trump regards the rogue government in the North as his most pressing international problem, he told the senators he was pursuing a strategy that relied heavily on using China’s economic leverage to curb its neighbor’s provocative behavior. 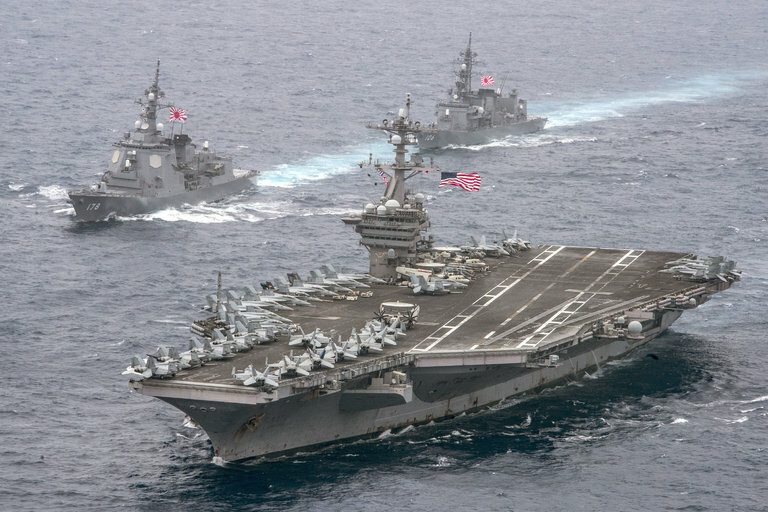 Recent American military moves — like deploying the submarine Michigan and the aircraft carrier Carl Vinson to the waters off the Korean Peninsula — were aimed less at preparing for a pre-emptive strike, officials said, than at discouraging the North Korean leader, Kim Jong-un, from conducting further nuclear or ballistic missile tests. Police secure the Champs Elysées after the April 20 shooting. Last Thursday, in an attack that has started to feel routine, Karim Cheurfi opened fire on French police on the Champs-Élysées in Paris, killing a police officer. Cheurfi then wounded two others before he was shot and killed. Police later found a note in which he expressed support for the Islamic State, which later declared him their "soldier." 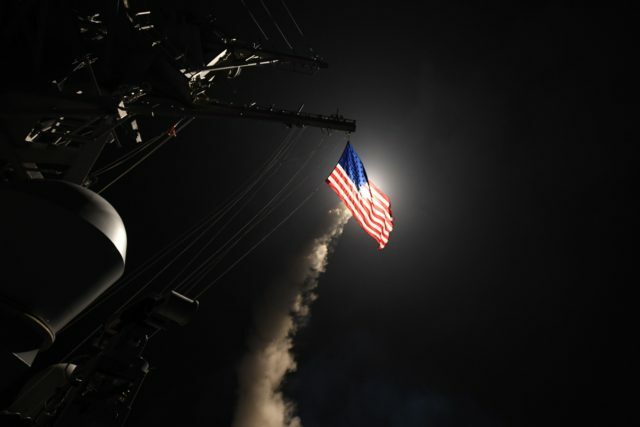 The nearly five dozen Tomahawk cruise missiles that the United States fired on Friday night (April 7) at the Syrian Al-Shayrat airbase produced far more political resonance than kinetic impact. Nonetheless, Russian President Vladimir Putin found himself on the receiving end of the shockwave. He was quick to condemn that “act of aggression.” At the emergency session of the United Nations Security Council, the Russian representative elaborated on the “breach of international law”—only to hear from Ambassador Nikki Haley about US readiness to take more “balanced” measures of the same kind and to hold Russia responsible for crimes committed by Syrian President Bashar al-Assad’s regime (Newsru.com, April 7). Prime Minister Dmitry Medvedev posted on his Facebook page a vitriolic comment on the Donald Trump administration’s “extreme dependency on the opinion of the Washington establishment,” which brought US policy in the Syrian conflict to “the verge of a military clash with Russia” (Interfax, April 7). Yet, no amount of angry rhetoric can camouflage the sharp deterioration of Russia’s international profile and its position in the Middle East. Given the rise of China and India as key technological competitors to the US, this report provides a strategic framework that’s designed to preserve America’s innovative edge. After diagnosing four distinct drivers of US innovation – R&D universities, human capital and intellectual property – the report’s authors focus on five key policy objectives the country should pursue, including the creation of sustainable entrepreneurial environments for startups and the promotion of commercialized research. The military’s geographical Combatant Commands (COCOMs). ARMY WAR COLLEGE: Global conflicts require global military decisions so the Joint Staff must step up to coordinate operations around the world, said a top aide to the Chairman of the Joint Chiefs. But, Marine Lt. Gen. Kenneth McKenzie told faculty and officer-students at the Army War College here, the Joint Staff can manage this role without new legal authorities and without undermining the authority of the nine Combatant Commands. In the end, the Chairman’s role will remain that of making recommendations to the Defense Secretary and the President, and it is these two — collectively the National Command Authority — who will make the decisions that cut across combatant commanders’ boundaries. Well, it looks like The New York Times has opened a bit of a can of worms by asking Was Marx Right?. I generally find that this question to be a bit annoying. Was Marx right about what, specifically? That labour is the True and Only source of value? No, he was wrong on that. That communism was an inevitable outgrowth of capitalism? He’s been wrong on that — so far, at least. That capitalism was prone to financial crises? Yes, he was quite right about that. I suppose I’ve made my point. Marx said a lot of things. It would be rather unusual if he were right about everything he wrote and it would be equally surprising if he was wrong about everything he wrote. Marx was right about some things and wrong about some things. Although the man had a marked tendency to play the prophet in truth he was really just a man, no matter how much some of his contemporary acolytes may insist to the contrary. He was right sometimes and wrong sometimes. Marx could not fully grok that rising real material living standards for the working class might well go along with a rising rate of exploitation and a smaller labor share. Thus he takes a demonstration that labor’s share of income might fall and without noticing turns it into a claim that the working class will starve. Today is the tenth anniversary of the world's first major coordinated "cyber attack" on a nation's internet infrastructure. This little-known event set the scene for the onrush of cyber espionage, fake news and information wars we know today. In 2007, operators took advantage of political unrest to unleash a series of cyber measures on Estonia, as a possible form of retribution for symbolically rejecting a Soviet version of history. It was a new, coordinated approach that had never been seen before. Today, shaping contemporary views of historical events is a relatively common focus of coordinated digital activity, such as China's use of social media to create war commemoration and Russia Today's live-tweeting the Russian Revolution as its centenary approaches. In 2017 and into the future, it will be essential to combine insights from the humanities, particularly from history, with analysis from information operations experts in order to maintain cyber security. From Russia's alleged role in the DNC hacks to this month's revealing Vault 7 leak of nearly 9,000 CIA documents, it should now be clear that keeping data safe is of paramount importance for any organization. Leaks and hacks are causing irreparable damage across the board – and it is now more essential than ever before for individuals, organizations, and countries to be aware of common cybersecurity threats and how to prevent them.